In light of my not so healthy recipe last week, I thought I would share a delicious salad this week. I have been dying to make a watermelon salad. I have seen so many different variations but I knew I couldn't go wrong with Ina's version. I served this a few weekends ago and it was a huge hit. The pepperiness of the arugula, the sweetness of the watermelon and the saltiness of the Parmesan cheese are the perfect combination. Enjoy! Yum! This looks so good yet so simple to make! I love Ina, I have gotten so many recipes and techiques from her. Will try this Ina recipe! I made a watermelon, feta and blueberry salad this weekend that is kind of similar. Watermelon is the best- love it! There was a watermelon vest last weekend and we missed it so it's all i've been thinking about! Yum this looks delicious! And I think your sidebar is normal now? I love arugula! This sounds so delicious! Yummy! This looks so fresh and simple. 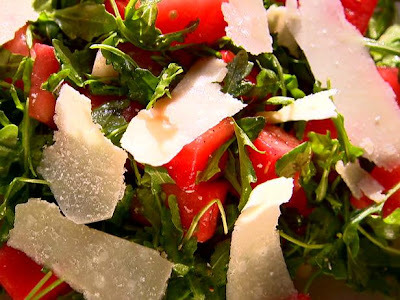 I love parmesan and arugula together - so why not add in some watermelon!? Sounds great! I'm making watermelon cocktails for vacation today, maybe I'll use the leftovers for this salad?? OH yuuuuuummmmm!! Looks so good and refreshing! Yummo!!! I am now going to have to go back to the store today to get watermelon to make this mouth watering salad!!!!! mmm, that looks yummy! love the sweet of the watermelon. glad you had fun on your relaxing getaway!! and i'm sure you have finished the help by now, yay! so excited to see it this weekend.